I have been offered jobs on the Hertfordshire, Southend on Sea and Essex Council. As well as my British High Commission extension. (all are free paid.) Essex has been selected as a pose to Tower Hamlets and our other West Wapping. Sitting under the ex News International Building as an Author. Granted Guardian snail and recruitment process. Can I be forwarded to myself, NSI branch code. Clearly the record-keeping has been slipshod and perhaps even incompetent. But once again, the smoking gun so keenly sought by the opposition has evaded them. What a pain, eh? As far as the substance is concerned, though, a contract race was probably wise. A bid of £876k ‘subject to survey’ usually ends up being a lot less than £876k. You get a surveyor in after you’ve closed the deal and he says, ‘there’s A, B and C wrong with it’ and then it gets revalued once all the other bids have been dismissed. So if there’s no actual criminality they’re just incompetent? Brilliant, we can all sleep a little sounder in our beds at night. Excellent post Ted – Could you please expand the paragraph starting “July 3 2013”, in particular the “20 or more objections”. Also, most seem to have missed one of the more significant scalps of yesterday’s reshuffle. Head of the Civil Service (and Pickles’ Permanent Secretary) Bob Kerslake got the boot. It’s worth mentioning Ted that there is ‘No evidence of illegality or maladministration causing injustice is revealed by the Investigation Report. 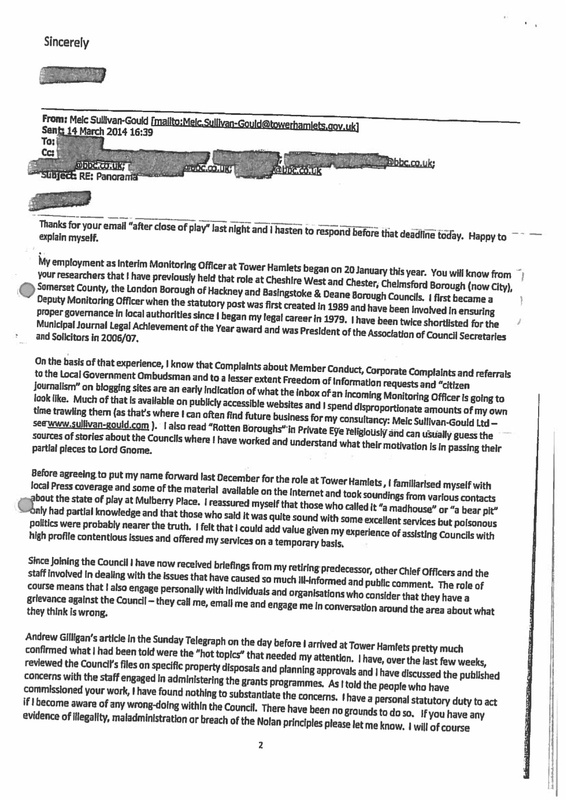 No elected individuals have been involved in the processes investigated except when they have attended Council meetings which have received reports and been publicly minuted in accordance with the Local Authority Access to Information regimes. The planning applications were quite properly considered and resolved by officers of the Council. For the avoidance of doubt, it should be remembered that the determination of planning applications is not an executive function that falls within the Elected Mayor’s remit; Mazars have found no evidence of any involvement of the Mayor in the matters which are outside his powers to influence or determine’. Mazars don’t mention the word maladministration in their report. That’s the council’s own view. What about the sale of Limehouse Library, I thought they were sold at the same time by BNP Paribas. That went for only £925,000. Its strange that Peter Golds does not raise any concerns about the sale of these properties when they were advertised in 2011 for six weeks. Neither does he flag up any issues when the property went for planning and notices were sent out to residents. Why did he time the enquiry and show he is shocked only three months before election? These politicians in Tower Hamlets are just dirty and devisive. We’re not talking about the library. Why Ted? The library is a much larger property and sold for only £925,000 and brought by a local restaurant owner. Because Poplar Town Hall is being talked about. Simple. What’s the allegation re the Library? Tim Archer raised it in 2012 as a motion to council. It went through the same process at the same time but was sold for less money, it’s double the size of Poplar Town Hall. If you are genuinely concerned about community assets then you should look at all the recent disposal. Sorry but what’s the allegation? Is there any allegation of cronyism? You do understand the issue on Poplar Town Hall don’t you ? I am surprised he is still in their employ – it reflects badly on TH. 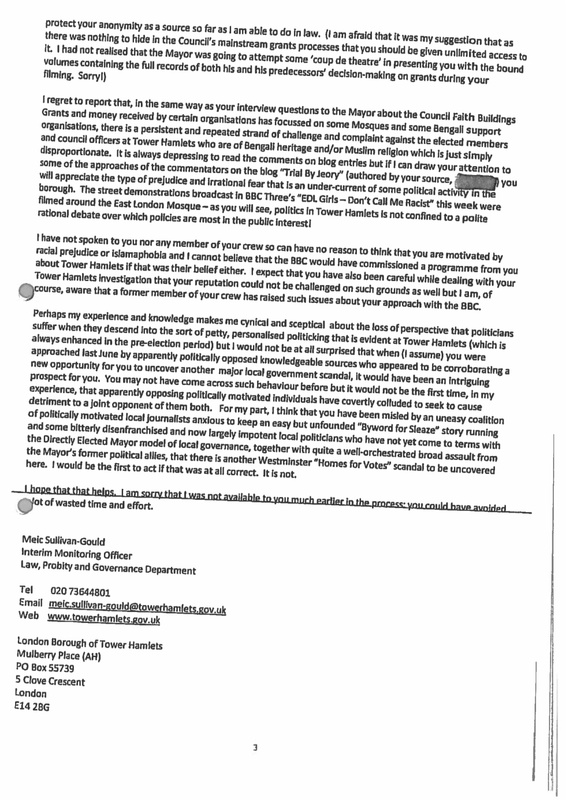 As a former Council Head of Communications, the first thing I would do is go to the CE and say he has clearly ignored the rule that all communications with the media need to be conducted through my section. He is also an idiot for writing how he did, never mind him possibly not thinking that this email could end up in the public domain! He clearly knew it would end up in the public domain. He wanted the world to know all about him. His lack of self awareness is in proportion to his arrogance and conceit. on July 18, 2014 at 1:05 am You couldn't make it up! I think he forgot to mention that those going up for Local Government Gong Awards have usually put themselves forward for it. They’re always pursued by the “me, me, me” brigade who like to take every opportunity to market their track records and advance their careers. His CV made me wonder why he’d bounced around quite so many Councils. There’s usually an interesting explanation.